FILE - In this April 4, 2018 file photo, a U.S. soldier sits on his armored vehicle on a road leading to the front line in Manbij, Syria. Days after U.S. President Donald Trump repeated his call to bring home U.S. forces from Syria, defense officials insisted there's been no shift in strategy or to U.S. policy. 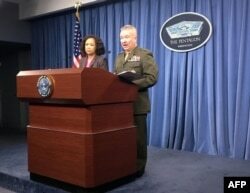 "Nothing actually has changed," Lt. Gen. Kenneth McKenzie told Pentagon reporters during a briefing Thursday. "We've always thought that as we reach finality against ISIS in Syria, we're going to adjust the level of our presence there," McKenzie added, using an acronym for the Islamic State terror group. Pentagon spokeswoman Dana White and Marine Lt. Gen. Kenneth McKenzie Jr. brief the media at the Pentagon in this April 5, 2018 photo in Washington, D.C. The U.S. has about 2,000 troops stationed in Syria as part of its ongoing efforts to destroy IS and dismantle the group's self-declared caliphate. But Trump has signalled twice in recent weeks that the time for U.S. forces to leave Syria was near. "I want to bring our troops back home," Trump said Tuesday during a news conference at the White House with the heads of three Baltic nations, adding he would "be making a decision very quickly." But in statement issued Wednesday, the White House said only that the involvement of U.S. forces in Syria is "coming to a rapid end." Despite the president's statements, top military officials have been more cautious, urging a continued U.S. role even as the fight against IS winds down. Gen. Joseph Votel speaks during a news conference with Defense Secretary Jim Mattis at the Pentagon, April 11, 2017. The commander of U.S. Central Command said it is looking to counter Iranian influence in the Middle East via cyberspace. 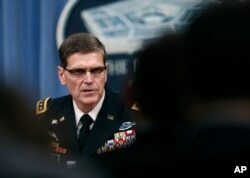 "There still are some areas where they [IS] are present and that we will have to continue to operate on," U.S. Central Command's Gen. Joseph Votel, who commands U.S. forces in the Middle East, said earlier this week during an appearance in Washington. "The hard part I think is in front of us," Votel added. "There is a military role in this, certainly in the stabilization phase." U.S. allies in the region have also expressed alarm, saying a withdrawal would "send a frightening message." Still, defense officials Thursday downplayed any concerns, saying there was no timeline for pulling U.S. troops from Syria and that their only criteria remained the defeat of IS. "I've heard rumors of people talking of withdrawal," Chief Pentagon spokeswoman Dana White told reporters. "I know the president said very soon because we have been very successful with defeating ISIS, but it's not over."